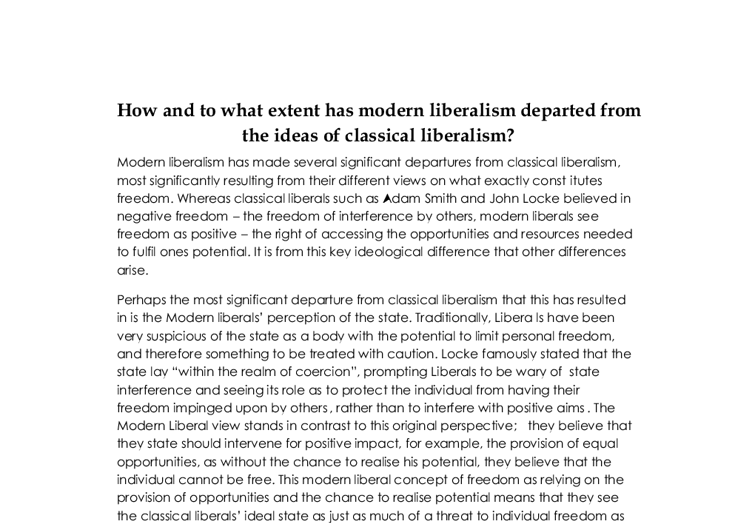 How and to what extent has modern liberalism departed from the ideas of classical liberalism? 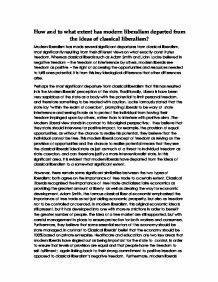 How and to what extent has modern liberalism departed from the ideas of classical liberalism? Modern liberalism has made several significant departures from classical liberalism, most significantly resulting from their different views on what exactly constitutes freedom. Whereas classical liberals such as Adam Smith and John Locke believed in negative freedom - the freedom of interference by others, modern liberals see freedom as positive - the right of accessing the opportunities and resources needed to fulfil ones potential. It is from this key ideological difference that other differences arise. Perhaps the most significant departure from classical liberalism that this has resulted in is the Modern liberals' perception of the state. Traditionally, Liberals have been very suspicious of the state as a body with the potential to limit personal freedom, and therefore something to be treated with caution. Locke famously stated that the state lay "within the realm of coercion", prompting Liberals to be wary of state interference and seeing its role as to protect the individual from having their freedom impinged upon by others, rather than to interfere with positive aims. ...read more. In modern liberalism, this original economic idea is still present, but it has developed into one with more restrictions in order to benefit the greater number of people. The idea of a free market are still supported, but with careful management in place to ensure protection for both workers and consumers. Furthermore, they believe that some essential sectors of the economy should be state managed, in contrast to Classical liberals' belief that the economy should be 100% based on private enterprise. Healthcare and education are two key areas that modern liberals have singled out as being important for the state to control, in order to ensure that levels of provision are equal and that people have the freedom to self-fulfilment; again linking back to their strong commitment to positive freedom as opposed to classical liberalism's negative freedom. Furthermore, modern liberals believe that taxes should be levied and regulation implemented across the economy again to aid the provision of certain state services and protect the consumer, something that has become known as Keynesianism after the modern liberal economist J.M. ...read more. T.H. Green, a modern liberal thinker, believed that Liberty was only attainable in favourable economic circumstances, and this necessitated some form of help to be given to those in need in order for them to be free, and modern liberals see welfare as a 'hand up, not a hand out'. This clearly represents a significant departure from Classical liberalism. Over the years, modern liberalism has departed from classical liberalism to a large extent. Their fundamental difference in what constitutes freedom - Classical liberals and negative freedom, the belief that freedom constitutes protection from exterior limits to individual liberty, and Modern liberals who believe in positive freedom, that liberty constitutes the opportunity to realise ones potential to its full extent - have lead modern liberals to depart quite significantly from the classical philosophy. They have rejected the ideas of a limited state and embraced the concept of welfare and social justice as well as imposing regulation and limits on the economy with the aim of securing individual liberty via 'positive', rather than classical liberalism's 'negative' liberal policy. ...read more. This student written piece of work is one of many that can be found in our AS and A Level Political Philosophy section. 5 Stars - A very strong essay. The structure and technique is excellent - the points are logically linked together, and the argument is constantly reiterated and re-evaluated before the conclusion is skillfully reached. subject knowledge and understanding is strong, with quotes and supporting material well selected and applied. The essay is also clearly and articulately expressed. Liberalism emphasises the importance of Rights in society, and that society's role is to protect these rights and put them first. Modern and Classical liberalism can be distinguished historically. Indeed when most people attempt to distinguish the two, placing the strands into time periods is perhaps the most obvious and easiest distinctions to make. The Fabians believed there should be a socialist political party which could gain power democratically, and as well as having a part in the formation of the UK Labour Party, they also influenced the German SPD, which became the largest socialist party in Europe, with a Marxist theory but a reformist approach. individuals survive more successfully if they associate with other individuals to form alliances and relationships beneficial to survival. Economically, individuals need to trade and do business with each other to obtain all the goods they require, and this cannot be achieved autonomously. Why did Marx Criticise Liberal Democracy? example the establishment of it in the first place after the war and the triumph over communism in the cold war. Now, there are no obstacles for a modern capitalist liberal democracy. If 'all men are created equal' then each individual should have equal opportunity to develop their talents and be equal before the law. Compare and contrast the concepts of Anomie and Alienation. Durkheim felt that normlessness led to deviant behaviour. Anomie is present when social controls are weak and when the moral responsibilities that control individuals and their behaviour are not strong enough to work effectively. Durkheim saw a number of gestures of anomie in the late 19th century industrial society: in particular, high rates of suicide, marital break-up and industrial conflict. To what extent have socialists been committed to equality of outcome? Meaning that they did not regard some inequality as undesirable, as a means of motivation perhaps, and that they wished to achieve their goals through evolutionary means; not revolutionary ones. Finally, equality in the old Marxist sense has all but been abandoned by New Labour and the Third Way. Replacing Gaddafi with the equivalent of a puppet assures America's entry, giving America unchallenged Mediterranean Basin dominance, a strategically important waterway bordering three continents. Hegemonic states also have great significance for Global Order since they are primarily responsible it appears for Humanitarian Intervention. This is known as ?development individualism?, linked to collectivism, as it entails ?rolling forward? the state, which will lay down the conditions that foster personal growth and human flourishing. This is another example of classical and modern liberals agreeing that individualism is important, but disagreeing as to the way in which to achieve it.